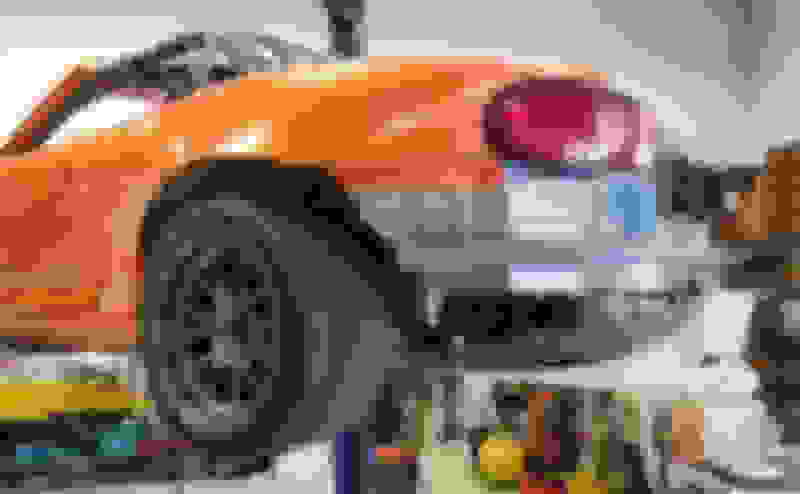 Rear Diffusers - Miata Turbo Forum - Boost cars, acquire cats. So yeah, let's make a central depository for diffuser ideas too. This is diffusor we are building for Vegas. .080 aluminum sheet. Stiff but fairly heavy. Probably 25lbs when it's all done. If it works, we'll replicate it in carbon. No time to do any validation, tuft testing, flow vis, active ride height measurements, etc. Throat and bottom edge of fences are level with flat bottom. We'll seal off the sides of the tub to keep tire wash from influencing pressure above the center of the diffuser. Looks high because wheels are at full droop. When parked the fences and throat will be about 4" off ground. We intend to tune the suspension with a bit more rake than we usually run so the flat bottom doesn't choke. Gap between upper surface and tub is about 1.5". Usinga few acres of DEI gold foil and insulation to hep keep Alumalite flat bottom from meltaging. That's in another thread. Also coating exhaust all the way to the exit to help keep temps down. Exhaust currently exits into last bit of center diffuser channel Haven't decided yet but I'm thinking of cutting a bunch of slats there. That would make about 30% of the diffuser blown. Issue is of course big time heat. We'll see how it lays out once it's all put together. Wanted to put another set of winglets above the outer diffuser section ala DTM but we don't have time. Bumper bar is temporary. It will come off. Part of me is nervous that it will work too well and we'll run out of spring despite running 1800/900. Good problem to have but we are way off the reservation now. Here you can see the short standoffs attached to the subframe and "buck" upper rib to help support the shape. Left channels mocked up. Large center channel. Right side not assembled yet. I would love to experiment with different volumes and heights for channels but again, no time for that. Sticking to basic shape. Divergence is pretty aggressive. Total included angle from throat to exit is 17°. We hope that the natural low pressure wake and additional pressure gradient from the massive 78" triple element **** will help keeps all the things attached. Even it starts to stall a bit, the net gradient will help the flat bottom do it's thing. 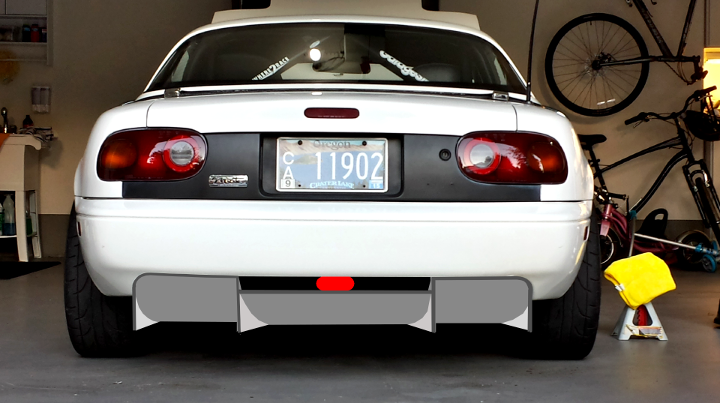 Diffuser should extend just a few inches past rear bumper skin. The intent is to keep the diffuser exit within the chord of the wing so the pressure gradients can interact. I'd recommend redoing the two braces that hold the rear section. That bend in the middle is asking for trouble, you want something that is held entirely in tension between the fasteners. The combination of downforce, bumpy track and stiff suspension will have no problem breaking the braces, especially with the rather heavy diffuser but even with a light one. 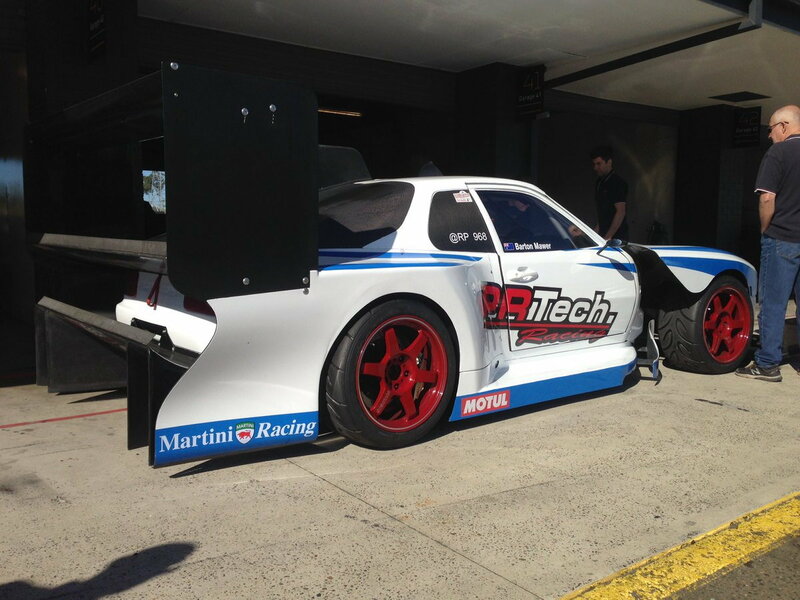 Agreed with Moti on the rear brackets. You want the material straight, no bends. I'd also prefer the bracket be rotated 90° on the Z axis so it's stronger in the fore/aft direction. Regarding height, mine was about 0.5" higher than what you have mounted, and still it's an item that takes a lot of abuse. I would recommend having spare diffuser strakes already cut and ready to swap in if/when needed. Exhaust heat should be OK with the reflective material on the alumalite and the exhaust wrapped. Diff temp will be less of an issue but do you have a cooler on the trans? In the interest of finding the lowest hanging fruit, skip the exhaust blowing into the diffuser. You can hurt flow as much as help it without more testing. Outlet above the diffuser/below the trunk, angled off to one side if that's where there's the most room. You guys are the forefront for this both in trying this stuff and fabrication so my hair brained ideas would have been tried long ago compared to my lack of spare time. My idea for floor and diffuser is very similar to what matt displayed in the Barge Board thread. 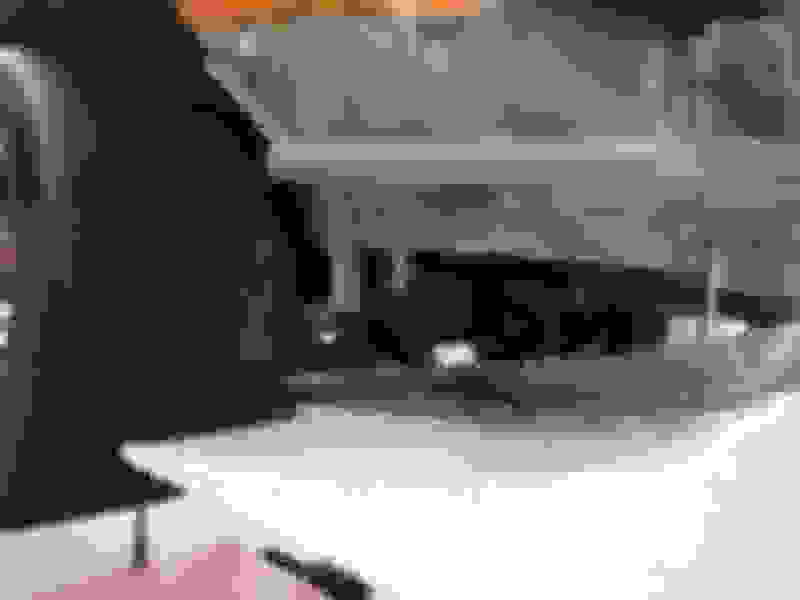 It would not extend beyond the bumper more than a few millimetres due not being a track only. The center section however would have a slight lower edge creating a box section between bumper and diffuser. That box section would hold a muffler tip stretched to fill it. 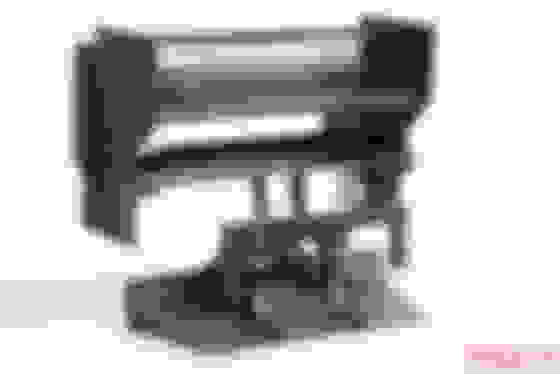 Hopefully angled with the diffuser plane and volumetrically similar or larger. This would help drive the diffuser efficiently and hopefully let the diffuser pressure help drive the rear wing (although I may have a spoiler instead). Last edited by rrjwilson; 10-30-2018 at 06:36 AM. Thoughts from others on this? Good rule of thumb? Longer/shorter? As often said by Ryan its not about parts but the whole system. 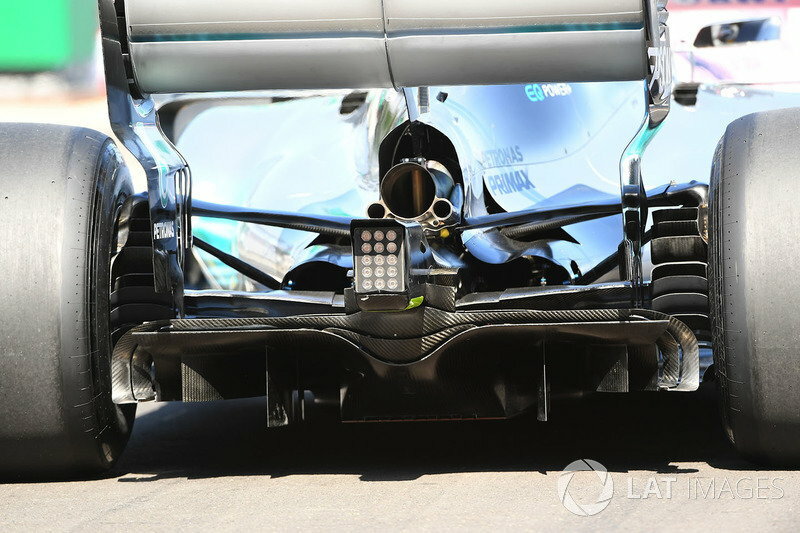 F1 systems link the diffuser to the lower rear wing which can aid the upper rear wing to increase efficiency so I would expect following that style would be optimal rule. At a guess I would believe the diffuser trailing edge should be pointed near the trailing edge of the rear wing possibly 6 inches behind. I suspect there will be some tested methods from others but this seems a logical style. That's why I was curious if anyone here had played with it. Typically, the delta in height between a diffuser exit and wing is considerably less in a formula car, so I was curious as to whether the length really played a factor in factory bodied vehicles. 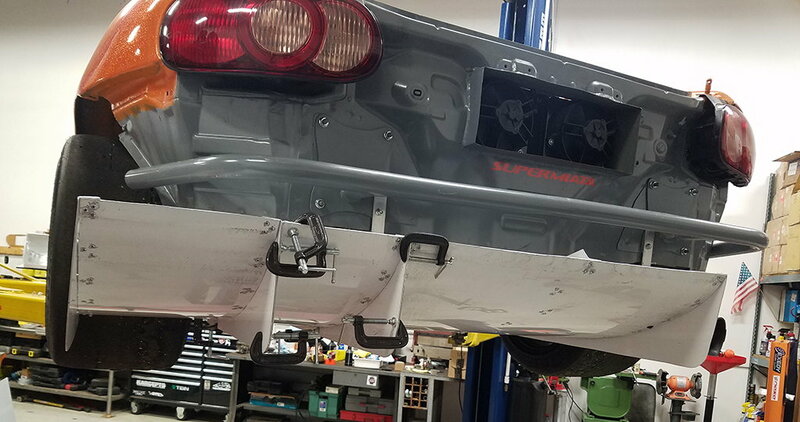 I do find it interesting that some cars with notoriously long rear diffusers like the MCA Hammerhead have abandoned that length in favor of flush mounting with the body, but have added a spoiler. The RP968 has it exit flush with the rear spoiler and trailing edge of the wing. Makes me wonder if they're using the spoiler to energize flow to both somehow. Without running many tests on CFD, all are just guesses. Interesting you mention the MCA shortening with a spoiler as that was what F1 was doing a few years back in having a lower wing and a upper wing. The diffuser drives the lower wing which in turn drives the upper wing. Given the change in downforce and drag between a single element and multi element wing with high chords I would guess there is a significant reduction in drag as well as increase in down force. I think the RP968 has something else at play though. Rather than smoothing airflow together to drive they have gurney flaps on the upper surfaces. This is meant to allow the opposite surface to maintain laminar flow up until the trailing edge so on the diffuser this is fine. On the spoiler there is no suction side because it is flush with the boot. I guess there could be some swirling to perhaps join lower pressure areas but no idea really. This was a good read on understanding how diffusers work. to interact with the pressure gradient from the wing in a beneficial way. Neither component works without affecting the other, so take advantage of it. I know you say you used a .080" thick aluminum sheet but what alloy did you use? Also it looks like you doubled up the thickness of the strakes as well by putting two sheets together, is this correct? Thanks and good luck at SLB! 5052 from a Sign Supply Warehouse. Strakes are indeed double wall. Last edited by emilio700; 11-06-2018 at 10:01 PM. Love all the info coming in! My plans for flat bottom leave the center channel open for hear disapation. While not ideal it does seem to be the best approach for 20-40 mins in wheel to wheel racing. With time attack guys typically run just a few money laps so heat accumulation is less of an issue. If/when we do a diffuser I have always wondered why a centralised oval exhaust outlet isn't utilised with a working rear diffuser in open rule classes. I get why F1 and LMP1 etc don't (rules) but I would have thought broadening the outlet would add/improve a blown diffuser effect. A 2 ish litre motor with forced induction at 6000+ revs is going to be pumping considerable air through....might be beneficial..? Though i don't know about the effect on the engine performance with an exhaust going from 3" round to (say) an 8" or more oval. That’s a given but still can’t see trapping exhaust in there. More important than changing the outlet shape is getting the outlet position and angle right with relation to the under-car flow. Nearly all DIY examples I've seen are done wrong. Ha, yes. Including ours. No Coanda effect at the angle we are inducing flow. To do it right would be to build a manifold that distributes multiple small jets at a shallow included angle to the surface of the diffuser. No time for such aero dweeb nonsense so we just hacked a hole for the whooshy to come out. Bigger fish to fry, like making sure it runs and stuff. emilio700 Any updates on Vegas' booty?